For my first item, I ordered this beautiful Melon Watercolor Floral Linen/Cotton Blend. I had used this type of fabric back in the fall, and fell in love with it. The weight is just perfect for a skirt with no lining- it has enough weight to drape nicely, and doesn't cling at all. I feel like it's pretty hard to find linen with printed designs, so I'm thrilled that Fabric Mart got more of it. This particular print is large, which is great for a tall person like myself. 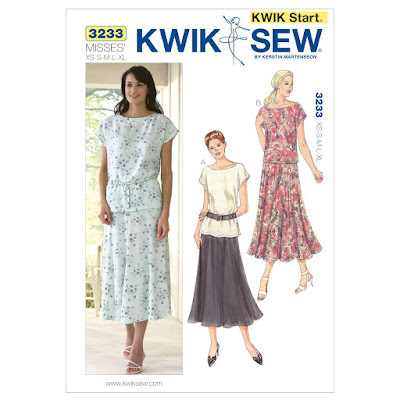 I didn't want a complicated pattern, so I chose Kwik Sew 3233- it is an 8 panel skirt with an elastic waist. It's basically just one pattern piece that you cut 8 times, but I did add in a rather large pocket, because I just have to carry my phone and keys with me all the time these days. My phone is so heavy though that I think I'm going to have to tighten up the elastic so that it doesn't drag the skirt right off of me! For my next item, a tunic, I used a similar cotton/linen print with a dark blue background. For this top, I used a pattern that I'd been looking for the right fabric for a decade, Vogue 8504. I'm always drawn to asymmetrical things, and this has both an asymmetrical neckline and hemline. It looks complicated, but it actually went together very easily! Probably due to the fabric- it's a nice stable fabric, so hemming it on the bias went smoothly. The pants are drawstring waist linen pants made from Fabric Mart's Paprika 100% linen. I love, love, love this color- a perfect rusty red-orange. I found the hat at a consignment shop and thought it picked up all the colors in this outfit. I wear hats when I'm gardening most of the time, but I must admit feeling self conscious in hats outside of my yard. What do you think of it? My last project is a navy blazer made from a Halston Double Weave Suiting- boy is this a nice fabric! The navy is sold out, but it is still available in cream. It might remind you of a ponte in weight and thickness, but it's not a knit- it just has a little stretch. I really struggled with choosing a pattern as I have made jackets in the past that I haven't worn, and I didn't want to repeat that mistake. Reasons that I haven't worn jackets in the past- too hot, too stiff, too short, too fitted. So, I chose a rather unstructured, unlined long jacket pattern, Butterick 6473. This one has a copyright of 2000, but it is still available on Etsy and Ebay. I chose the hip length, 3/4 sleeve, cuffed view, and I did add patch pockets as well. I really, really like it! It's none of the things that I haven't liked about previous jackets that I've made. Since it's unlined, it's not too hot; it's hip length, loosely fitted, and the fabric is substantial, but drapes beautifully. I even left off the interfacing in the lapels just to make sure that it wouldn't be too stiff anywhere. I also think that navy blue is just such a classic Spring color. I am really looking forward to wearing it with lots of different pieces. I hope that your Spring is off to a good start, as well as your Spring sewing plans! What are you in the mood for sewing this month? WOW!!!! 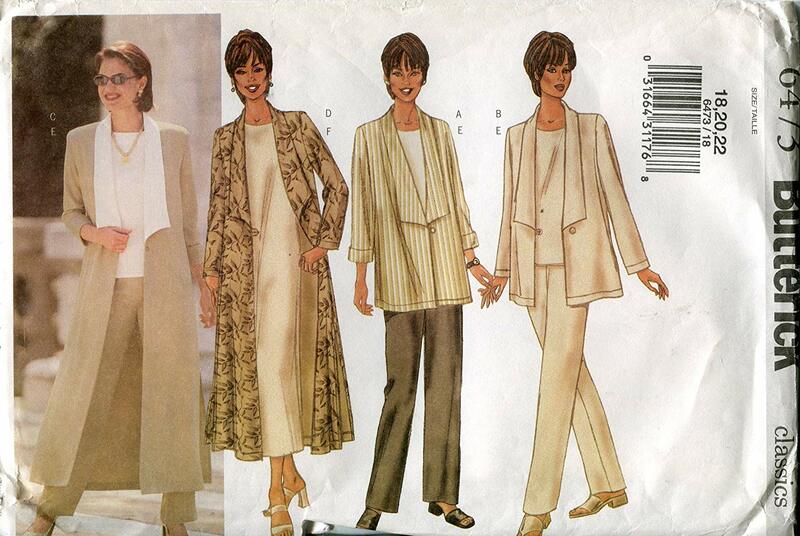 These outfits are fantastic and you sew magnificently! You look great in them! Enjoy! Thank you! I am wearing one of them as I type this! Everything is so pretty Ann!! I love your color story so much!! I especially love the asymmetric top and paprika pants. I usually dislike asymmetric tops because they look so unbalanced and "draggy" to me but this one is very well balanced. The hat looks terrific and you need to wear it, and other hats, beyond the yard! All of these looks are terrific and I really coveted these fabrics too. I hadn't looked at the top like that, but yes, I agree. I think that pattern is well drafted. I will try wearing the hat outside of the yard- thanks for the encouragement! I love your pattern/fabric choices. I have some of that printed linen and wasn't sure what to do with it. Thank you for the inspiration! It took me some time to think of what to make also- with the large prints, it's a little tricky. I had 2-1/2 yards of each of them, and that gave me some flexibility. I have one more piece that I think I'll try making a dress out of, so I'll be covering just about every category. Your outfits have turned out so lovely! The hat suits you and your outfit very nicely. Your choice of fabrics and colours are flattering and Spring-like. Is the cotton/linen blend fabric difficult to care for? It looks very comfortable. Thank you! The fabric blend is very easy to care for. I've washed the shirt that I made last fall several times, and I find that I haven't needed to iron it, nor has it shrunken considerably. I'm not sure what the percentage of cotton is in it, but the combination is quite nice. Ann, what great pieces you've made! You look great in all of them! They all look so comfortably elegant! Love the hat, by the way! Just beautiful pieces! I LOVE the skirt and jacket especially. You always choose just the right styles that look amazing on you ,Ann . Thank you, Diana! It's always fun experimenting with new patterns and fabrics. Great makes! 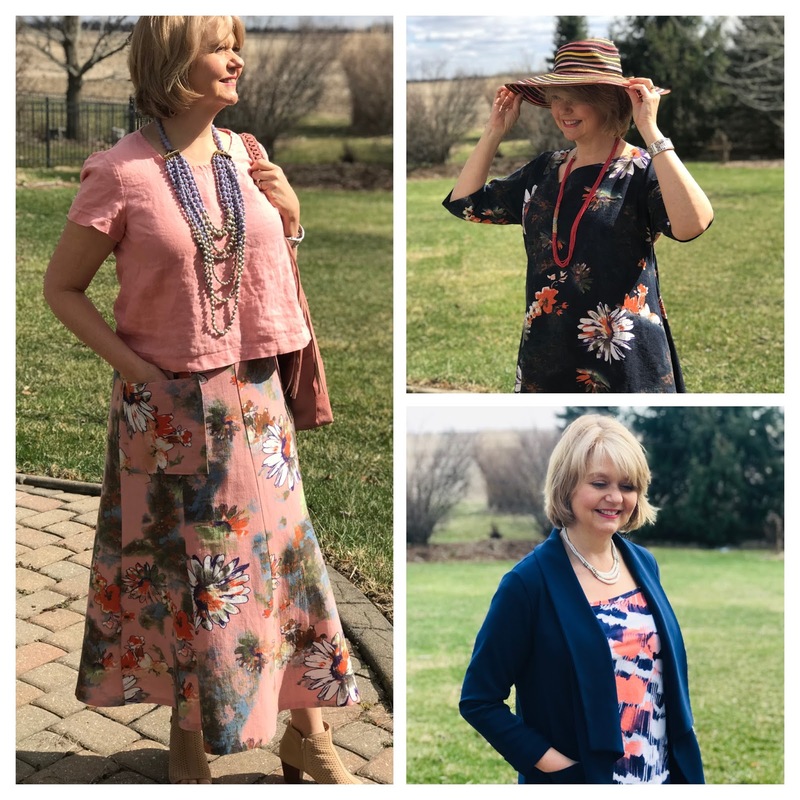 The colours and the prints work really well, and I especially love the pink outfit as well as the navy floral top with the paprika linen pants! Wow! I was mulling over whether to sign up for Julie's Picks and this post convinced me. I hope to make some things as pretty as your new outfits!